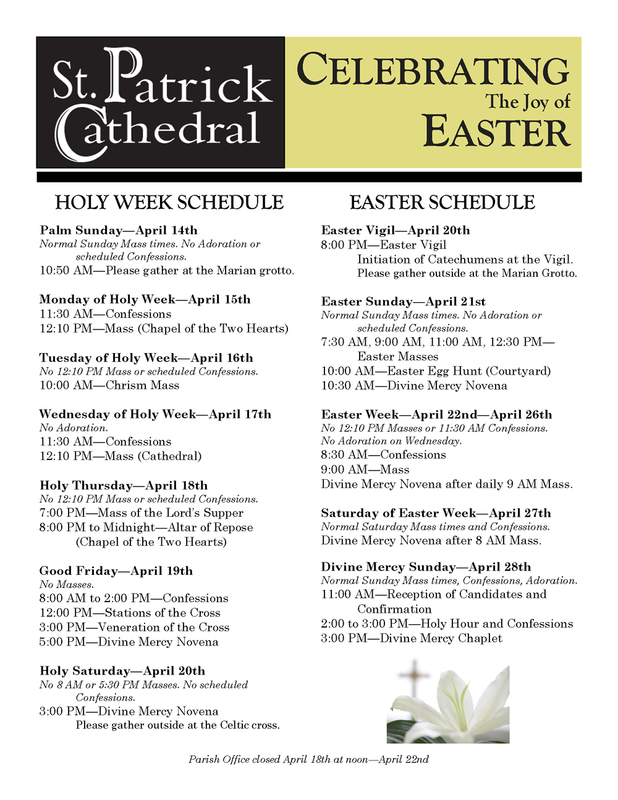 The Cathedral of Saint Patrick: What is the Catholic Church? The Catholic Church is a single, unified, visible society, instituted by Jesus Christ in order to carry on His saving mission after His Ascension into heaven. Thus, the Church is endowed by Our Lord with everything necessary to accomplish this mission. First, Jesus gave the Church the authority to teach in His name, thus guaranteeing the truth of Her teaching. Second, He gave Her, in the Mass and the Sacraments, the means to sanctify men and draw them closer to God. Third, He gave Her the authority to rule and govern all men in those matters which pertain to salvation. These powers were given by Jesus not to all the members of the Church individually, but rather to certain men, the Apostles, whom He chose especially to rule His Church. The apostles were united under the supreme authority of Simon Peter, whom Jesus chose to be the visible head of the Church on earth. The Apostles and their successors, the bishops, united under Peter and his successors, the Popes, have exercised this authority continuously since the time of Christ. As St. Cyril of Jerusalem remarked, the Church is called Catholic because it is spread throughout the world, from end to end of the earth; also it teaches universally and completely all the doctrines which man should know concerning things visible and invisible, heavenly and earthly; and it subjects to right worship all mankind, rulers and ruled, lettered and unlettered; further it treats and heals universally every sort of sin committed by soul and body, and it possesses in itself every conceivable virtue, whether in deeds, words or in spiritual gifts of every kind. Speaking of full membership in the Church, Pius XII, in his Encyclical on the Mystical Body, said it is the society of those who have been baptized, and who profess the faith of Christ, and who are governed by their bishops under the visible head, the Pope, the Bishop of Rome. The Church came into being when Christ died on the Cross, but it was formally inaugurated on Pentecost, when He sent the Holy Spirit as He had promised. St. Paul speaks of all Christians as members of Christ, so that with Him, they form one Mystical Body. The Church, the Mystical Body, exists on this earth, and is called the Church Militant, because its members struggle against the world, the flesh and the devil. The Church Suffering means the souls in Purgatory. The Church Triumphant is the Church in heaven. The unity and cooperation of the members of the Church on earth, in Purgatory, and in Heaven is also called the Communion of Saints. We often speak of the four marks of the Church as one, holy, catholic and apostolic. By the marks of the Church, Christ gave us clear signs by which all men can recognize it as the true Church founded by Jesus Christ. The Church as One. The Catholic Church is one because all its members, according to the will of Christ, profess the same faith, have the same sacrifice and sacraments, and are united under one and the same visible head, the Pope. Only the Catholic Church possesses this mark of unity. Various sects, having only fragments of Christianity, are divided in doctrine and practice and recognize no authority but their own judgment, which can easily lead them into error. The Church as Holy. The Catholic Church is holy because it was founded by Jesus Christ, who is all-holy, and because it teaches, according to the will of Christ, holy doctrines, and provides the means of leading a holy life, thereby giving holy members to every age. We say the Church is holy, not in the sense that all members are holy. But her Founder gave it all the needed means to make people holy. Holiness is a mark of the Church according to the will of Christ, as is evident from the prayer of Christ for His apostles. The Church is Universal. The Catholic Church is catholic or universal because, destined to last for all time, it never fails to fulfill the divine commandment to teach all nations all the truths revealed by God. Catholicity is a mark of the Church because Christ commissioned His apostles to go forth and make disciples of all nations, and to teach all that He had commanded. Christ further promised to be with them all days, even to the end of time. The Church today teaches the same doctrine it received from Christ. It has existed uninterruptedly since the day it was established down to the present time. The Church is Apostolic. The Catholic Church is apostolic because it was founded by Christ on the apostles and, according to His divine will, has always been governed by their lawful successors. The true Church is apostolic because it is the Church Christ founded upon the apostles, and especially upon Peter whom He called the Rock on which the Church would be built. The supreme power of Saint Peter in the Church has been passed down through the unbroken line of his successors in the See of Rome. 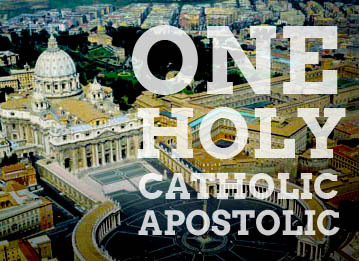 The Church is one, holy, catholic, and apostolic because the kingdom of heaven already exists in her. This kingdom has come in Christ, grows within the hearts of believers, and will be fully manifested on the Last Day, when all are gathered into one People of God. This kingdom is the heavenly Jerusalem which has the names of the twelve apostles of the Lamb written on its foundation (Rev 21:14). Because of Jesus' command to make disciples of all nations, the Church has been divinely sent as "the universal sacrament of salvation" and must preach the Gospel to everyone. The Church is missionary because (according to the Father's plan) she has her origin in the mission of Son and Spirit. The Church exists to bring all men into the communion of the Father, Son, and Spirit. God "desires all men to be saved and to come to a knowledge of the truth (1 Tim 2:4). Therefore, the Church must go out to those who are seeking God and bring them the Gospel. "In the Creed, we profess the Church to be one, holy, catholic, and apostolic. These four characteristics, inseparably linked with each other, indicate essential features of the Church and her mission. The Church does not possess them of herself; it is Christ who, through the Holy Spirit, makes His Church one, holy, catholic, and apostolic, and it is He who calls her to realize each of these qualities."